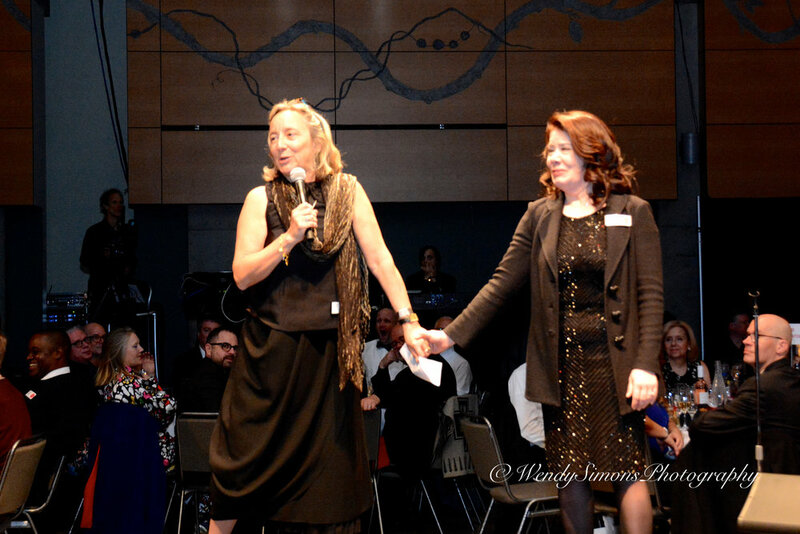 We’re proud to share that with your support, our 2019 Benefit Art Auction raised $520,000 for funding, training, and resources for Washington State artists! Save the date for the 2020 Benefit Art Auction on March 28th, 2020! Explore this website to learn more about the Benefit Art Auction, our annual fundraising gala. Questions about this year’s event? Contact us. Learn more about Artist Trust at artisttrust.org. Explore our efforts to sustain our signature grant programs for decades to come at campaignforacreativefuture.org. This event is dedicated to the memory of Paul G. Allen, honoring his lifelong passion and support for artists of all disciplines. Want to be the first to see the artwork and plan your bids? Join Artist Trust Board President Sarah Traver, CEO Shannon Halberstadt, and Co-Chairs Michael Lane and Tanya Trejo for a champagne toast and tour through the collection on the evening of March 29th. Preview is complimentary with the purchase of Champion and Benefactor tickets, or corporate sponsorship at or above $1,500. 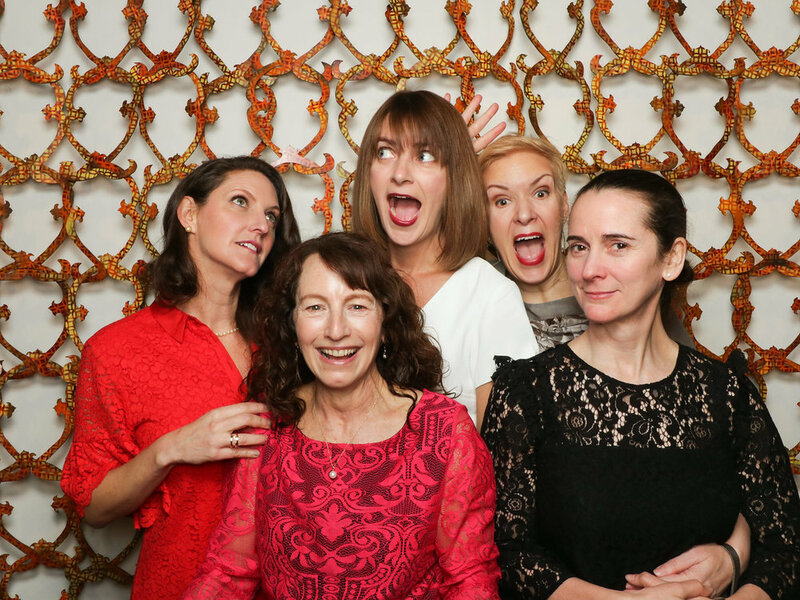 Guests strike a pose in the Hello There You photo booth in front of a custom installation by artist June Sekiguchi. This year's installation artist is RYAN! Feddersen. 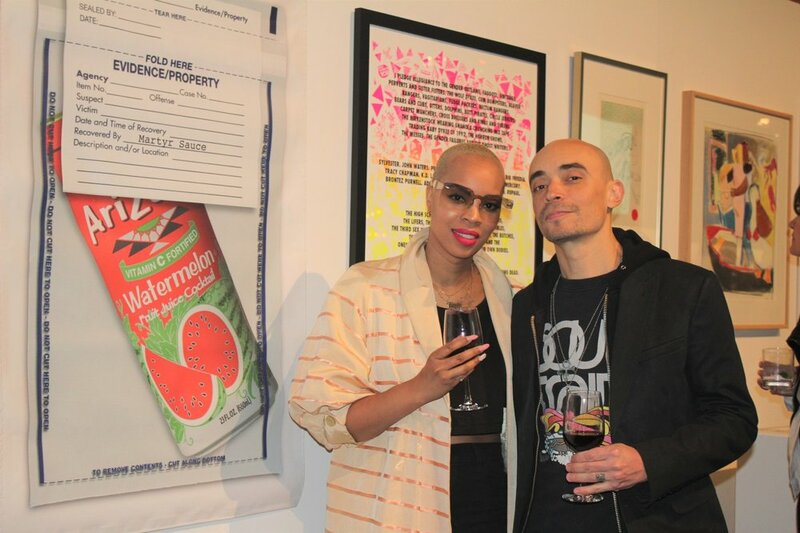 Artist Tariqa Waters and husband Ryan Waters in front of her piece Evidence/Property. The auction features over 100 pieces of original artwork donated by Washington State artists in three silent auction rounds and one thrilling live round! The Artist Trust Board of Trustees thanks attendees before the 'Fund the Artists' frenzy! Fund the Artists is our paddle raise: a chance for guests to support Artist Trust's mission by making tax-deductible cash contributions - this year, donations made the night of the auction will be matched up to $50,000 by the Klorfine Foundation! Auctioneer Laura Michalek pulls the winning Golden Ticket. Guests can purchase Golden Tickets for $100 each for a chance to take home the artwork of their choice! Where is the auction? Fisher Pavilion, Seattle Center, 305 Harrison St, Seattle, WA 98109 (Lower Queen Anne). Directions from I-5: Exit at Mercer St and head west toward the Space Needle. Left on 5th Ave. Right on Denny Way. Right on 2nd Ave N. Fisher Pavilion is located near Thomas St & 2nd Ave N.
Where do I park? Use a taxi, Lyft or Uber! With multiple events at Seattle Center, traffic and parking is congested, limited and paid parking lots in Seattle Center fill up. If you must drive, carpool or arrive early, keeping in mind that Key Arena will be under construction. The closest parking garages to Fisher Pavilion are the Mercer St. Garage (enter on 3rd Ave. N between Mercer and Roy St.) and the 5th Ave. Garage (entrances on Harrison St. and Republican St., just east of 5th Ave. N). Valet parking will be available at the corner of 2nd Ave & Thomas St. for a $30 fee. How do I purchase a table or tickets? Click here to go to our ticketing site, or call Development Coordinator Justine Deacon at 206/467-8734 x18. Can I buy tickets at the door? Our annual auction always sells out, so get your tickets early! If I am unable to attend, can I make a tax-deductible ‘regrets’ gift? Absolutely! Click here to donate on our ticketing site or call 206/467-8734 x16. How should I dress? This year's theme is Space & Time. Dress to impress, with a creative flair. We recommend dressing in your celestial best, ready for a night spent on the astral plane - think planetary bodies, sacred geometry, and anything else you might see (or dream up) sparkling in the night sky. Check out our Pinterest board for some inspiration! Can I volunteer for the auction? Yes! Volunteering is a wonderful way to support the auction, and volunteers receive a free year’s membership to Artist Trust and an invitation to our volunteer celebration party. Fill out our volunteer survey to sign up! Can I still donate artwork or art experiences to the auction? We are no longer accepting donations of artwork or art experiences for our 2019 auction. If you would like to make a donation in support of our 2020 event, please contact Emily Dennis. Can I still sponsor the auction? 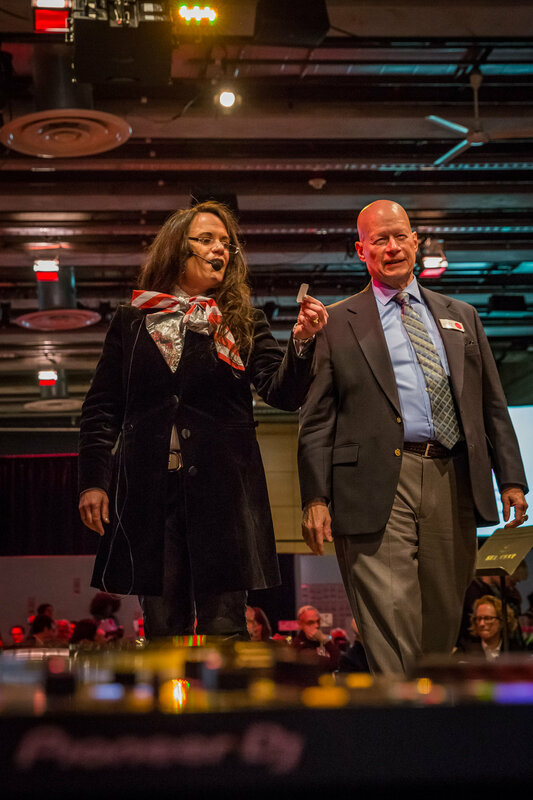 The Benefit Art Auction is our highest profile event of the year, and we have many options available to help you and your company meet your philanthropic goals, all with great event benefits! Click here for more information, or contact Emily Dennis at 206/467-8734 x16. What does Artist Trust do? Artist Trust is a nonprofit organization dedicated to supporting individual artists working in all disciplines throughout Washington State. Visit our website for more information! Why is the auction important? The auction is Artist Trust’s largest single fundraising event, accounting for about 30% of our annual income. All proceeds go directly towards funding, training, and resources for individual artists of all disciplines across Washington State. My question is still not answered. Please contact us! Call 206/467-8734 x16 or email us. Dancers from The Three Yells perform a piece choreographed by Veronica Lee-Baik. The auction features performances from recent Artist Trust' grant recipients; this year’s performer will be announced soon!